Hi everyone! I just published an article on Lady Kitt’s WORTH at the Femme Art Review. This publication is a tremendous platform for LGBTQ+ and femme artists, as well as artists of color. I am so happy to contribute to a publication with such an important mission. Lady Kitt’s cut-out portraits of powerful femmes are the focus of WORTH. 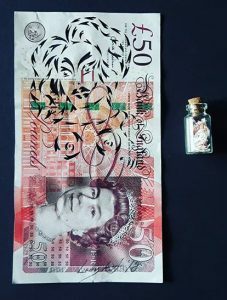 These figures, carved into fifty pound notes, call to question the way we assign value in society. Is it a moral process? A fiscal one? And how should this system change? Read more about WORTH, open until November 30th at Praxis Gallery in Newcastle, HERE.